97 cm textual records and other material. Series consists of records generated by the Bastion Theatre Company of British Columbia through the marketing and promotions of their productions and activities, arranged into five series: Campaign management, 1965-1988; Print media, 1971-1988; Programs, 1963-1988; Audio/visual media, 1978-88; and Posters and displays, 1982-1988. 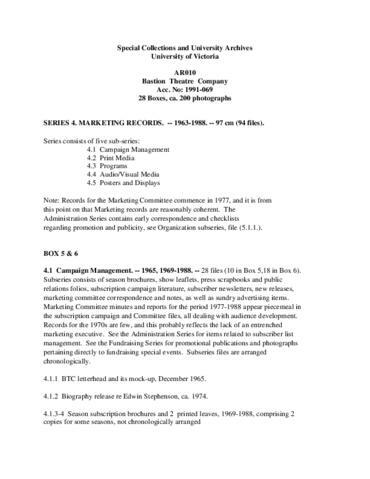 Included in this series are the records of the Marketing Committee, 1977-1988; brochures and other promotional ephemera; news releases and press clippings; scrapbooks; theatre programs; audio/visual recordings of radio advertisements, interviews, and theatre performances; and production posters. Includes photographs, scrapbooks, posters, audio cassettes, videocassettes, and 1 button.